A breakdown tool that plays the video during the breakdown. Create a complete breakdown with one node. There are other tools to create breakdowns of your shot, but they all seem to lack the feature of playing the video during the breakdown. - Supports up to 40 inputs. Feedback would be greatly appreciated, as this is the first nuke tool I ever built! Thanks! On what numbers do you have to connect the source and the final comp? Can I see a preview in the viewer or do I have to render first? Hi! I just replied to you mail (hopefully it did not end up in the spam box, sometimes mail from my domain does that). The first input should be the original plate, and the last input your final result. Except, of course, if you want the layers to be gradually removed from the final result to the original plate. 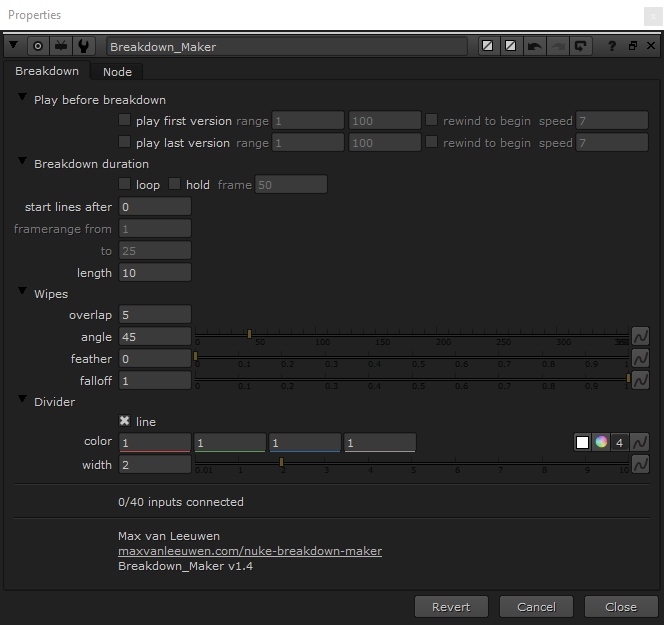 You can see a preview in the viewer, I think the easiest way to know where Breakdown_Maker is doing its thing is to set the viewer range to "Input". Hey. Thanks for great tool. In last ver I've got a problem on 10.5v7 with line - it disappears in the end of it's animation in right side of the image, in previous ver 1.3 there are no such problem. Hi! I couldn't replicate the problem - is your viewer framerange set to 'Input'? And are all 40 inputs connected, or less than that? Hi, I have just noticed that the line doesn't appear if the frame range doesn't start at the 1st frame. Any advises? Hey, love the gizmo, but it only works for 10 inputs. Everything >10 is not recognized anymore. I am on the latest version and I use NukeX11.2v3nc. Not sure if it is a bug or I am doing it wrong, tested it several time, always stuck at 10.